Pancreatic cancer’s furtiveness is what makes it so deadly: Symptoms of the disease rarely emerge until it is nearly impossible to eradicate. 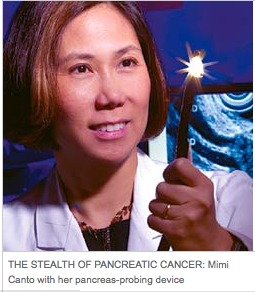 Eight years ago, Mimi Canto, a gastroenterologist who specializes in a technique called endoscopic ultrasonography—which can detect pancreatic lesions as small as 2 millimeters—decided to find out whether that technique could act as an early warning system. Her plan would be to study people most at risk for this cancer, those with two or more diagnosed relatives, and see if she could pick up precursors to the disease. Seven of the patients she identified successfully underwent surgery, offering pathologist Ralph Hruban an opportunity to study the resected tissue. “We learned,” says Canto, “that there are pancreatic cancer precursor lesions in large and small ducts that cause chronic pancreatitis. This explains why we see chronic pancreatitis-like changes during screening tests so commonly.” The study has also provided specimens for biomarker research being conducted by pathologist Michael Goggins. John's Hopkins Medical Institutions unveils possible early detection device.